Peas have come to an end. Tomatoes are just starting. Beans are not yet producing as the plants are still growing. Cucumbers yes, squash not yet. 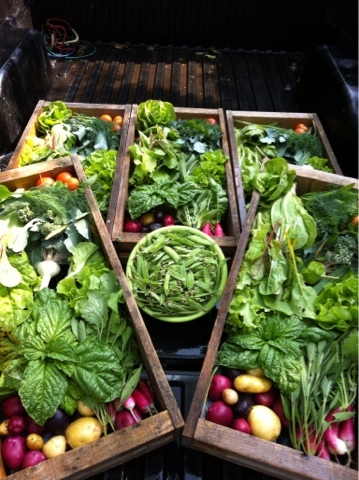 We have had regular harvests of carrots, beets, radishes, lettuces, and amazing potatoes. Last fall we planted three times the garlic as in years before, so we have had a good run on garlic. Greens, like Swiss chard, spinach, rainbow chard, collards and kale have been beautiful. Now the many tomato plants are loaded with not yet ripe tomatoes. Dill, basil, thyme and parsley are ready too! In this heat, seed starting is a real challenge. Seeds need constant moisture to sprout and the soil dries quickly. Watering with the drip tape will maintain a vegetable plant, but these days of 100 degree weather means watering of seedlings is like watering of the livestock...several times a day, all day, if the plants are going to make it. And the farmers too! Hydration. Must happen for everything, everyone all day. No rain in sight. Maybe the weeds will not grow?